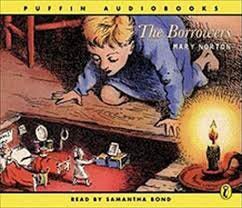 One of the first books we lis­tened to in the car was Mary Norton’s The Bor­row­ers. We had one child and he was very small. But he’d been well-trained on audio books. He fell asleep to The Vel­veteen Rab­bit (Meryl Streep and George Win­ston) or Win­nie-the-Pooh (The BBC ver­sion) every night. So we popped in the tapes (yes, cas­sette tapes—this was a good fif­teen years ago) to The Bor­row­ers on a trip to Bloom­ing­ton, Illi­nois to vis­it friends. The boy did not fall asleep. He did not look out the win­dow. I’m not sure he blinked. He just stared straight ahead. I’m sure it was mag­i­cal, the voic­es of The Clock Family—Pod, Homi­ly, and Arrietty—swirling around him. The Clock fam­i­ly are bor­row­ers—they are a fam­i­ly of tiny peo­ple who live under the floor, in the pipes, and in the walls of an Eng­lish house in the coun­try­side. They bor­row (real­ly, they steal, but we won’t quib­ble about that) what they need from the “human beans,” who also reside in the house. The Clocks have extend­ed rela­tions, as well—Lupy and Hen­drea­ry, and the posthu­mous Egglati­na. Egglati­na is used as the cau­tion­ary tale for Arri­et­ty in the first book—Egglatina is miss­ing and her dis­ap­pear­ance cor­re­spond­ed omi­nous­ly with the arrival of a cat in the house. In the sec­ond book (there are five) Egglati­na is found to be alive and well, but still, the bor­row­ers live in mor­tal dread of being seen. Much of the plot revolves around this aspect of self-preser­va­tion. Because, of course, Arri­et­ty, the teenage bor­row­er, has a bit of wan­der­lust. She wants, at the very least, to learn to bor­row with her father. Real­ly, she wants some adven­ture and excite­ment—upstairs and out­side. She has some adven­tures, alright! Qui­et, British adven­tures most­ly. (Which is why the audio is so good—it real­ly does need a British accent and mine is real­ly rather bad.) It’s a very gen­tle book. But still, one’s heart pounds when Arri­et­ty is (spoil­er alert!) seen. Our lit­tle boy, who cried when we stopped to get gas and use the bath­room on that trip (“More Awi­et­ty!” he cried), is look­ing at col­leges now. He wants to go into engi­neer­ing. I think this might have some­thing to do with The Bor­row­ers. Seri­ous­ly. The Clock fam­i­ly mem­bers are inge­nious in their abil­i­ty to take com­mon every­day things that won’t be missed from the human beans and repur­pose them, in the most inter­est­ing of ways, for their own use. Car­pet fibers form a scrub brush, red blot­ting paper serves as car­pet, old let­ters turned and hung so the script runs ver­ti­cal­ly makes a unique wall­pa­per design, pret­ty postage stamps hang on the wall as art, chess pieces serve as stat­ues, etc. This book helped both of my kids (I read the series to the youngest sev­er­al years lat­er) look at every­day objects at a slant and think about what else they might be. What is it about lit­tle peo­ple who live behind books, in walls, in the doll­house, and lead whole lives when we human beans are not watch­ing? I remem­ber being fas­ci­nat­ed by this idea as a kid. My kids were, too. Any­one else have favorite books along these lines? Where did you get the book on tape?